The hottest stock on the Dow Jones Industrial Average is Intel. Here's how it went from market laggard to a hot investment. The Dow Jones Industrial Average (DJINDICES:^DJI) is shrugging off the geopolitical concerns that riled markets early in trading Monday, standing a slight 0.2% in the red at 3:30 p.m. EDT. The crash of Malaysia Airlines Flight 17 in a sector of Ukraine controlled by separarists has put Russia and the U.S. in a tough political situation. There is increasing belief that separatists brought down the passenger aircraft with a Russian-supplied missile, and for now U.S. President Barack Obama and Russian President Vladmir Putin appear to be in a staredown over what to do next. The U.S. could increase sanctions on Russia with the help of Europe, but Putin has an economic incentive not to let the situation escalate that far because his nation is already being isolated by Western powers. Now that officials are being allowed to investigate the crash site tensions are easing somewhat, and stocks are moving higher as a result. But don't be surprised if this is an up-and-down week as tensions ebb and flow. One stock doing exceedingly well is Intel (NASDAQ:INTC), which is up another 1.2% today, bringing its total gain to 31% this year to lead the Dow Jones by a wide margin. Intel's rise this year is really more the story of a comeback in expectations than it is about the chipmaker's results. 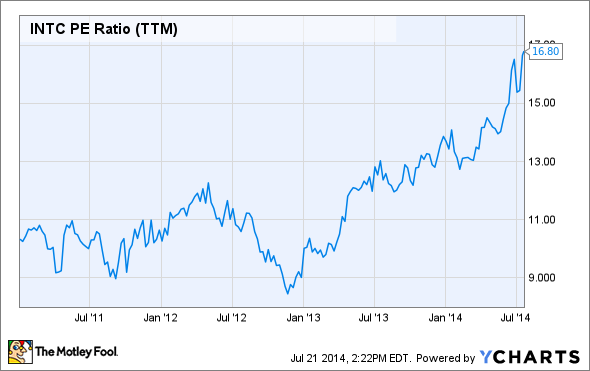 Coming into 2014 Intel's stock had been left for dead by the market. Shares traded at just over nine times earnings to start 2013 and just over 13 times earnings to start this year. That's a price normally reserved for a no-growth company. INTC P/E Ratio (TTM) data by YCharts. Little was expected of Intel in 2014 because chips that may gain share in mobile or the Internet of Things aren't going to impact earnings until late this year. So it wouldn't be until 2015 and beyond that the company might grow -- or so we thought. Throughout 2014 it's been apparent that the PC refresh cycle was picking up steam, particularly in corporate America, and that Intel would be one of the beneficiaries. So, instead of PC chip sales falling and new products slowly filling the gap for flat revenue overall, those new products are building on a growing PC chip sales base. Just look at how Intel's 2014 guidance has evolved over the last six months. 60% +/- "a few percentage points"
63% +/- "a few percentage points"
Intel's stock came into the year with a very low valuation and then management slowly ratcheted up expectations, which led to a higher valuation based on already posted results, as you can see from the rising P/E ratio above. But Intel is also improving its actual results, not just its forecast. Second-quarter revenue was up 8% from a year ago, while earnings per share of $0.55 was up an incredible 41%. The P/E ratio is rising but so is the "E" in that equation, the earnings that have already been reported. That formula has resulted in market-crushing returns for Intel, and I don't see the momentum stopping. The company's 14-nanometer technology is just now being rolled out -- ahead of competitors' technology for the time being. As the Internet of Things rolls out, Intel should be playing from ahead in that growing market instead of playing from behind like it did in smartphones and tablets. Intel may not crush the market for the rest of this year, or even next year, but investors should feel comfortable with it in their portfolio. Those sitting on nice profits should just hang on for the ride.